I skied my first tournament in Italy, in Albarella. I was nine years old, and this was where I first met Rodney Molenkamp and Filippo Ribaldone. I really liked it when I first started barefooting, I enjoyed just getting out on the bar, playing around and having fun. Because I always wanted to be one of the top skiers like David Small and Keith St. Onge, and one of my big goals was always to jump inverted. Dave Small & Keith St. Onge - Before they are doing every trick in the book, and making it look so easy! Ben Groen - Because he is a great skier, and a hard worker. Ashleigh Stebbeings - Because she is not only kicking girl's asses, but the guy's asses too! 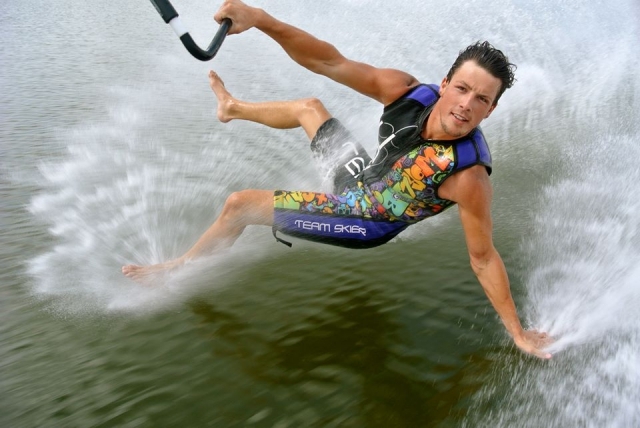 I try to ski every day in the summertime, and in the Winter I try to ski as often as possible at the World Barefoot Center in Florida. Right now I am a student, studying sports education. In the summertime, I work at a Sportscenter teaching kids all different kinds of sport. Success is not the key to happiness, happiness is the key to success - If you love what you are doing, you will be successful.